Wondering what steps you can take to lose the weight after pregnancy? Today I’m sharing 10 strategies to help shed those additional pounds post baby and rock that mom bod! You’ve spent the last nine months pregnant watching the pounds slowly creep up on the scale. Although in your mind, you know that the weight gain is necessary to support the growth of your baby, you’re eager to get your body back and start feeling like yourself again. Ready to whip yourself back into shape…ready to fit back into your cute clothes…ready to feel like YOU again…and not like a huffing and puffing whale carrying around a ton of bricks. Believe me, I know this exact feeling. Although I was thrilled to be pregnant and to experience that feeling of having a baby growing and kicking around inside of me, by the end of my pregnancy, I was DONE. I reached a point where I just wanted to meet my baby, start spending time with my little family and NOT feel like I was carrying around a gigantic beach ball day after day. But then, the big day comes and the baby arrives, and you think, FINALLY, maybe JUST maybe I can start feeling like myself again. But there are SO many distractions. Feeding the baby every 1-2 hours, changing what feels like a million diapers, trying to figure out why the baby just spent the last 2 hours wailing at the top of his lungs, and maybe going to the bathroom in between all the chaos…. only to start the whole process. Those first few weeks can be HARD. And let’s face it, there’s not a whole lot of time to focus on you. While you’re loving every second with your new little baby, you can’t ignore that feeling deep down inside of wanting to shed those additional pounds that crept up during your pregnancy. Although it can be hard, I encourage you to spend those first few weeks really enjoying your baby, getting the hang of the whole motherhood thing, and soaking up every moment because it does go by fast! At the same time, I understand the feeling of being eager to get yourself back into shape again and the good news is that it’s totally doable! Today I’m sharing with you ten simple strategies to start shedding the baby weight ASAP! During pregnancy, we get used to consuming those additional calories to support the growth of the baby and it can be easy to continue that routine long after we’re done being pregnant. But this is where we have to start listening to our bodies to determine if what we’re feeling is actual hunger. And we can start by asking ourselves these questions. Do you think you’re hungry (appetite), or do you actually feel hungry (hunger)? It’s important to discern between appetite and hunger before deciding if you actually need a snack or meal, or want to graze on food. By asking ourselves these questions, we can prevent taking in those extra calories that our bodies probably don’t need. As a new mother, it can be easy to go long stretches without eating because we’re so distracted with taking care of our new baby. But it’s really important that we aim to eat a meal every 4-6 hours, with healthy snacks 2-3 hours after a meal as needed. Skipping meals or going too long without eating can result in over-eating later on, which definitely won’t help us progress closer to our goals. This is one of my favourite strategies! It might sound simple, but it works! Veggies are low in calories & high in fibre so they’re going to keep us feeling full for longer without adding a bunch of extra calories! Choose veggies to nibble on at snack time, and aim for at least half a plate at lunch & dinner. It happens so gradually that we don’t even notice. Instead of half a cup of rice, we serve ourselves 1 cup. The chicken breast that not long ago was always a precise 4 ounces, now weighs in at six ounces. A few extra calories here and a few there might not seem like a big deal. But they do add up. If this sounds familiar, it can be a good time to refresh your memory on portion sizes. Or another strategy is to try eating on a smaller plate. This is a trick for your eyes to tell your stomach that you’ve had enough food. Still feeling like you could have more? Go to step #5! It takes 15 minutes for our stomach to tell us that our brain is full. So, before going back for seconds or taking that last bite, it’s important that we sit back & listen to our body to see if we’re really still hungry! The calories in beverages (for example: coffee with cream & sugar, flavoured hot drinks, juice, chocolate milk), salad dressings, sauces, and fried foods add up. It’s important that we keep an eye on how many of these extras we’re consuming, or better yet, skip them all together! You can check out my recipe box if you’re looking for some healthier options! I’ve never been one to focus on counting calories. Instead, I find a better approach is to focus on planning a healthy balanced diet and monitoring portion sizes. These two strategies combined can help keep us on track with our weight loss goals. Remember the 80:20 rule. 80% of the time, focus on eating healthy, portion controlled and balanced meals and the other 20% of the time, enjoy the occasional indulgence. This strategy can help us enjoy our favourite foods while still achieving our health and fitness goals. 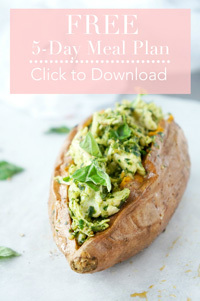 If you need some help planning your meals, you can download my free menu planner here! is awesome)! At the end of the day, we want to aim for 150 minutes of physical activity every week. It took 9 months to gain those extra pounds, so keep reminding yourself that it may take some time to lose it as well. It’s important to be realistic and not too hard on yourself. I know this can be REALLY difficult when you just want to start feeling good about your body again, but you WILL get there if you put your mind to it. Also, when setting realistic goals for yourself, keep in mind that a good goal for weight loss is about 1 – 2 pounds per week. By following these guidelines, it can help ensure that the weight loss is healthy and more sustainable. Try not to obsess over the scale, but instead focus on the fit of your clothes or how you’re feeling overall. There’s so much more to feeling good about our bodies than the number on the scale! At the end of the day, being a new mother can be such a challenging, yet rewarding time. Although this time is full of distractions, you can start getting yourself on track again by paying attention to both the quality and quantity of foods that you’re eating, establishing a plan of action, staying adequately hydrated and getting active as soon as you get the go ahead from your healthcare practitioner! 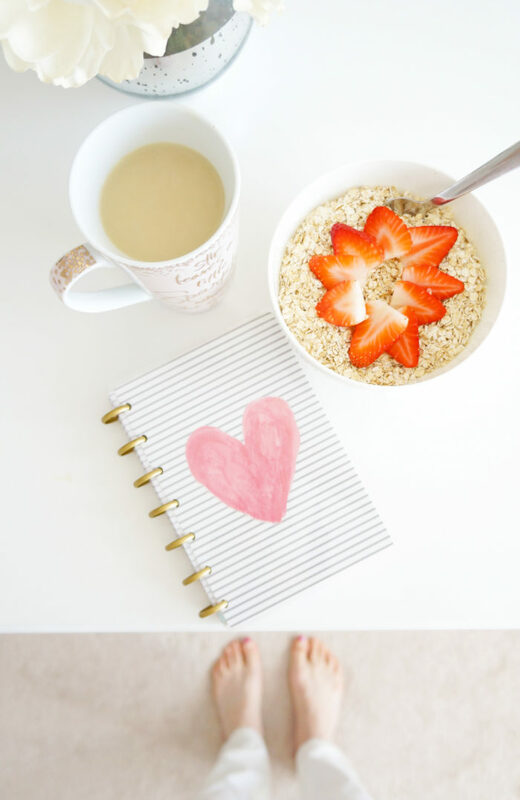 If you’re looking for some help getting on track, you can download my healthy living planner here or by entering your email address below! What are some of the steps you plan to take to get back in shape post pregnancy? If you’ve had a baby, what strategies helped you shed the extra baby weight? Want to save these tips? Pin for later! I have lost 40 lbs just by drinking Mummy magic weight loss tea and a lot of my health issues have gone away when I started to introduce solid food back into my diet. I eat what the call clean eating and I have been able to keep the weight off and it’s an all natural way of losing weight. That’s great Angela — I’m happy to hear that you’ve found a strategy that’s worked for you! At the end of the day, it’s all about making lifestyle changes that are sustainable for the long-term. Keep up the good work! After my pregnancy, I am very worried about my weight. I want to lose it but after doing many things I can’t lose the weight. I think your tips are helpful. I’ll try to follow it. Thanks for sharing this. Thanks for stopping by Rosemary! I know that it can be challenging to lose the weight following pregnancy, but if you stay consistent with eating right and exercising, I know you’ll be successful!